Clinton’s bank balance may have increased dramatically since leaving the Obama administration, but her approval rating has plummeted, suggesting that Americans are not as "Ready for Hillary" as her supporters would have us believe. 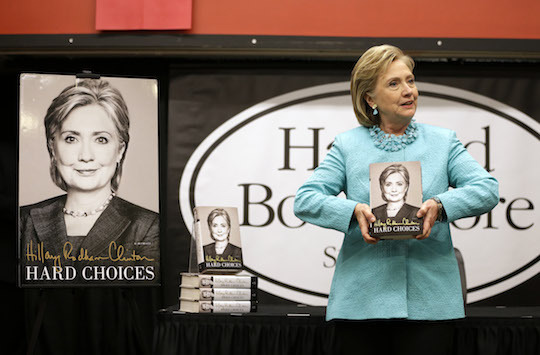 It seems that the more Americans are exposed to her, the less they like Hillary Clinton. An NBC News/Wall Street Journal poll released on Wednesday found Clinton’s public approval rating at a mediocre 44 percent. Voters are not exactly clamoring for her to run, either. Just 38 percent of registered voters said they would "probably" or "almost certainly" vote for her in 2016, while 37 percent said they would definitely vote against her. For some reason, voters appear to be having trouble relating to someone whose idea of being "dead broke" involves "struggling" to finance the purchase of two multimillion-dollar mansions while her husband rakes in more than $100 million on the public speaking circuit. In fact, Hillary’s poll numbers are at their lowest point since the 2008 presidential campaign, when her approval rating fell as low as 37 percent during her unsuccessful primary bid against Barack Obama. And if she couldn’t even beat the guy who picked "Hope and Change" as his campaign slogan, what hope does she have against more formidable opponents such as Joe Biden? This entry was posted in Politics and tagged 2016 Election, Hillary Clinton, Ready for Hillary. Bookmark the permalink.